Hello, Good Morning to all of you guys. Hope you all had a good weekend and Hope we all have a good profitable trading week. Now, last week we saw GBPUSD's free fall and it tested areas below 1.3000 level and it broke past the exhaustion line that we had in place around 1.3030-40 area and price remaining below that area for a quite of a time now denotes bearish strength and denotes continuation and price continuation till the next exhaustion line, which we now have at 1.2930-940 area. So, I am still bearish on GBPUSD and would look for it to hit 1.2930-940 area but again it wouldn't fall directly and now it's looks like GBPUSD is looking for a retracement and a correction. And, a correction of around 1.3100-120 level is easily possible, so I will wait for the correction and would look to sell GBPUSD from a good higher level to make most out of this setup and in the meantime, if I get any quick scalping buy opportunities during GBPUSD correction process then I would take that but my major trade would be SELL from a higher Level and target to 1.2930-40 level. I wish you all the best and I hope we all trading with discipline and follow are trading plan and trade safely. Hello, Good Morning to all of you guys, I hope you all are doing well and had a good trading day yesterday. I didn't traded yesterday as I was not on terminal and was busy with some outside work. 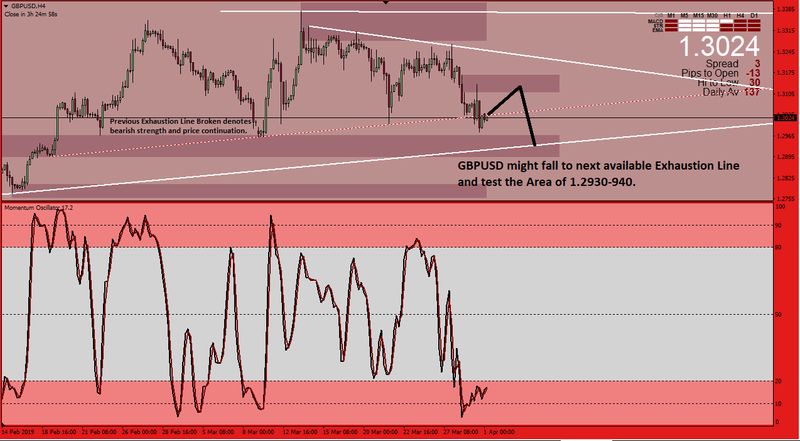 Hopefully, today I will strictly stick to the terminal and follow GBPUSD for some trading opportunities. Regarding GBPUSD, yesterday, I was expecting a correction till around 1.3120 level but to my surprize it got corrected till 1.3150 level and now I guess, 1.3150 level will provide strong resistance and supply to GBPUSD. Now, according to my Exhaustion System, I have 4 Exhaustion Lines, as you can see in the image below, the first exhaustion line that I have is around 1.3230-250 level and the fourth or last exhaustion line that I have is around 1.2930-950 level. Second exhaustion line that I have around 1.3130-150 area and third exhaustion line I have around 1.2980-1.3000 area. So, according to my exhaustion system, we get following Market Key Points from where market can reverse. *Note :- Buy/Sell around these exhaustion lines only if you get Bullish/Bearish Candlestick Pattern around them (on lower or current Timeframe) + Divergence on lower or current timeframe + Momentum in your direction on timeframe on which you got Bullish/Bearish Candlestick Pattern & Divergence. The following 15 users say Thank You to MartyFish for this useful post. 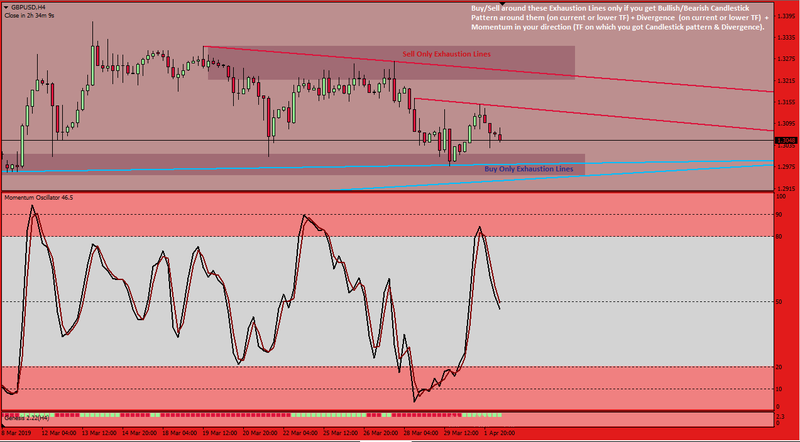 Friend good morning and nice to see your analysis i am first time seeing this exhaustion system and hope you are confident on it beacuse it makes sense dear i am also selling this pair but missed the entry from 1.3090 with a few pips and the trade hugely sell off but no worries there are some other pairs to trade. Friend have a good day. Hell MartyFish, don't be so surprised about the correction on GBPUSD, i expect it yesterday, and it did moved up. I was unable to wait further, i had to close my trade at 1.3113, and that give me 50 pips, that is a good analysis, and i loved it. But now, it is good for traders to be more certain on where the market will be going before they trade it. The analysis that i made on the 200SMA on the 4 hour time frame is pointing to the fact that the market will be falling more, that is what will be looking towards as my today's bias on the GBPUSD. The following 3 users say Thank You to ola4real for this useful post. good evening martyFish , i hope you make good profit this week . 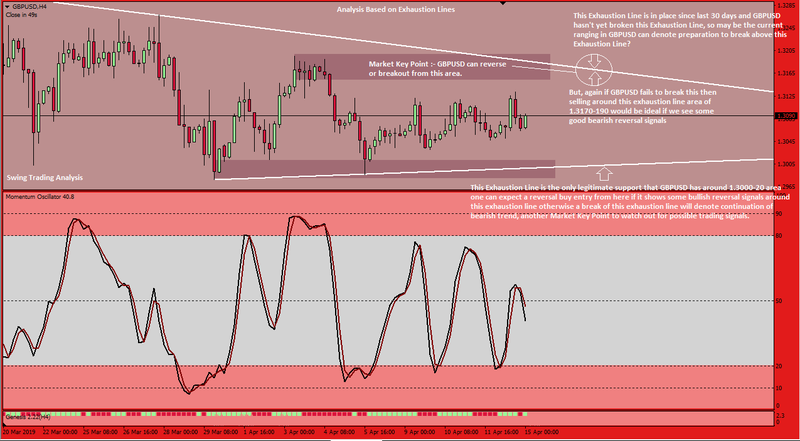 Good analysis dear and i have analyzed this pair today and i expect this pair will be bullish this week because GBPUSD right now at bullish general trend at the daily chart + moving average 200 is under the current level by 100 pip thats mean its very close from it , stochastic indicator supports the buy because there is overselling at this indicator and i think stochastic will go up soon , i have put my target at 1.31310 resistance level and if the price broken this level we maybe see big rising at GBPUSD in the next few days . The following 4 users say Thank You to BowSlayer for this useful post. The following 3 users say Thank You to Techie for this useful post. Hello and good evening mate. It's okay that you are not trading yesterday. It is better don't trade than trade but loss, right?. I hope your works are doing well. Well, when I see GU, I see the price movement is not clear. I got loss about -4.66USD on GU but it's okay, I will try to recover back. Luckily I used small lot size. Hello Good Evening MartyFish, that was too bad for you not to join yesterday because market in GBPUSD giving good sign of profit yesterday. For GBPUSD right now in level of support on 1.3005 like before and i still see the chance that it will going to bounce again and break last time top in 1.3141 and probably it will going to level 1.3190. The following 2 users say Thank You to enlight for this useful post. Hello, Good Morning to all of you guys, I Hope you all are fine and doing good. I wasn't online for last 10 days and didn't posted anything here because I was quite busy due to my personal life, as my younger sister just had a newborn baby some 9 days ago and because of that I couldn't managed to trade or to post here and this break of 10 days is feeling like a huge break and now with everything done, I am back to my routine work, so let's get started. GBPUSD :- Brexit again is looking like it wouldn't get resolved soon and we will continue to experience some complex moves in GBPUSD, so trade with utmost care if one is trading GBPUSD, like me. 2. A Crucial Market Key Point - whose break can denote change in trend/sentiment. Right Now, I have 2 Exhaustion Lines, one is bearish and one is bullish and we can expect reversal signals around them and the break of both will denote continuation. From Intra-day perspective there's nothing much based on my Exhaustion Lines System but it may develop as the time progresses, so I will update my journal with Intra-day Analysis once I see something is cooking. Wish you all the best mates and I hope we all start this trading week on a good note, trade well and trade safe. The following 24 users say Thank You to MartyFish for this useful post.